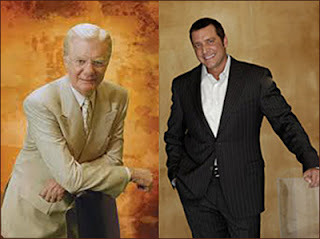 Bob Proctor, he of Secret fame, is putting his mouth front and center in the wake of James Ray's guilty verdict. "Anybody had the right to leave there (the sweat lodge), and they didn't. Some did," Proctor said. "It was a tragic thing that happened, but I don't think (Ray) should be the one that's held responsible. Earlier, when he was interviewed on In Session, Proctor allowed that Ray had law of attracted this for some reason. I guess the most generous reading of Proctor's logic is to say that Ray was spiritually responsible but not materially or legally responsible. He attracted this debacle, maybe because he let himself think some unhappy thoughts. Why, oh why, didn't he put on some happy music and chase the negativity from his mind? In a 2007 interview with Dan Harris James Ray articulated his views on the issue of personal responsibility. He even put the statement on his website. I heard a lot of the same kinds of statements when I was just a whippersnapper in this new age arena. I heard them because I asked the same kinds of questions. The blame the victim implications of law of attraction beliefs never sat right with me. And the kind of response, articulated in that for instance by Ray, has always sounded like so much parsing to me. It's just playing at semantics. See if you can follow the logic here. Where's my Secret decoder ring... As per Joe Vitale, there are no victims in the Haiti earthquake. The Haitians are responsible because of their negative thoughts. But as per Bob Proctor, James Ray is not responsible for the deaths of three people even though in exchange for their money and volunteered service, he packed them into an "hellacious hot" tent and urged them to "transcend" their feelings of impending death. The self-described master of the lodge proceeded to dismiss concerns called out by people who thought that Kirby Brown and Liz Neuman were in trouble, and said they'd take care of unconscious people after they were done. Then he ordered more heated rocks and poured more buckets of water. And when the ceremony was over and people were running around trying to save lives by dragging people out, calling 911, and performing CPR, Ray cooled himself under a tree, chatted on a cell phone to someone other than 911, and then went back to his room for shower and a sandwich. I guess you could say he was not responsible... in the sense that he acted totally irresponsibly. I also think it's interesting that Proctor doesn't just say that Ray isn't responsible. He implies that someone else should be held responsible. I can only assume from the context that he's referring to James Shore, Kirby Brown, and Liz Neuman. After all, they could have left. Others did. And we're right back to the same blame the victim idiocy I've come to expect from adherents of the The Secret. Every one of us is responsible for our own reality and only our own reality. We don't actually have any impact on other people. We're just in our own little worlds, making our own choices, and living with the consequences. In this case, the choice made by these three was to take Ray at his word and do what he asked of them; what he reminded everyone they had paid for. I remember years ago, I belonged to a healing circle and one of the leaders did something inappropriate that hurt and angered someone. I don't even remember what it was. He acknowledged his error but explained that it was part of that other person's learning experience that he had drawn to himself. I found that explanation stunning. What kind of spiritual teaching says, Hey, I did you wrong, but you're creating your reality so you need to take responsibility for the wrong I did to you. You're welcome! Such is the crazy, fun-house mirror world of the new age arena, in which everyone is responsible but the teachers, the leaders, the gurus. And we're only really responsible for the experiences we draw to ourselves; not the wrongs we do to other people. That's the punchline on Proctor's statement and on Ray's behavior. It doesn't even surprise me. I've seen it all before... except for the gruesome, horrible death part. How much differently might all of this played out if Ray had taken actual, no kidding responsibility for his actions... and inaction? What if he'd made a plea agreement, admitted his guilt in the sweat lodge deaths, apologized, and made some restitution to the families. This whole thing would have gone a lot easier... on him. He wouldn't have blown through his fortune paying legal fees. He wouldn't have attracted as much media attention. He would not have burned so many bridges with former students or made total enemies of the bereaved. I have said for years that the fatal flaw of The Secret is that it's all about the glorification of the ego. You can have whatever you want. You can be whatever you want. And it's all through the power of your mind... in other words, the power of your ego. James Ray is a shining example of what happens when the ego runs completely amok. And he's just crashed and burned on his own grandiosity. "My feelings on it are James Ray was totally bogus. None of his credentials panned out," [Kim] Brinkley said. "We walked into that sweat lodge believing in his training, paid for his knowledge and wisdom, which was all false. Whether or not he goes to jail, somehow, this will force James Ray to take responsibility." Procter doesn't seem to have understood the verdict. He talks about the influence of the"subtle powers" of the LoA, but Ray was convicted of an extreme failure to recognize the most basic level of cause and effect. The question isn't "Why did he create this" it's How the hell did he not see it coming? This has nothing to do with the "higher powers" that Procter is selling; it has to do with the grossest level of reality. Not subtle energies reality; not even sub-atomic particles reality; but huge slabs of concrete and boulders rolling down hills reality. Ray's entire defense was based on the idea that no reasonable person could possibly have possessed the level of perceptive ability required to see people dying straight in front of their eyes as a direct result of that person's deliberate, carefully planned actions; their deliberate intentions for which, they even proudly placed on audio tape. What more does Procter need to realize that the causes of this are not to be traced in a harmonic convergence of mysterious and financially inspiring quantum energies, but in the stunning degree to which Ray had his head up his own arse. Every single $elf-help teacher who says anything about this is, like Procter, just jockeying for position in the new world order. Sorry for soap-boxing...Procter just irritates me incredibly for some reason. I'm glad you're shining a light on all this stuff, LaVaughn. @ Yakaru, No need to apologize. And I'm with ya. Procter was one of the most irritating voices in what was, for me, a very irritating movie. The Secret I mean. No one understands electricity. It's a great mystery. Dear God this stuff is puerile. Yakaru, brilliantly summarised, JAR in a nutshell. You totally nailed it. Unfortunately, his entire family STILL don't get it - check out his brother Jon's FB page. @sunnysideup, Hold the phone! He lives in Raytown, MO? Jon Ray lives in Raytown? Did he search the map to find a town with his name in it? Is this a frigging family of narcissists or what? No, no. Just worked out that way. He just liked the um... that one tree there. It was just callin' his name. Raytown. Unbelievable. By the way, I meant to say Thank You to you too for providing such excellent updates. Those of us who live on the other side of the world can't get CNN live - or dead - so your succinct, intelligent writings have been invaluable. @sunnysideup, I know. I saw the email on Connie Joy's page. Wow. I will be posting that directly. Creepy. I've been doing a little digging. She apparently was a JET leader. I was unfamiliar with this strange world of lounges and JETs. But I do know that "when you're a JET, you're a JET all the way; from your first cigarette 'til your last dyin' day." And I'm glad you're enjoying the blog. I've started to post a comment several times before-- I've been following the trial via your blog-- but I had password woes and always ended up distracted before I solved them. Time and time again I wanted to express that I am deeply thankful for the time and work you've put into this. I'm not exactly sure why but I've been quite taken with this case, so much so that day after day I'd check your blog to see if there we updates. It has meant a lot in my life. That said, I was shocked to see a mention of Raytown in your comments! I just so happened to drive through that very town today. (It's not terribly far from where I live or work but I never have reason to go there.) I know it's not amazing, but there's really nothing to Raytown and I hear very little about it even living in the Kansas City area, so hearing about it connected to this sweat lodge trial obsession of mine was surprising. And, sort of repeating myself, but I agree with other commenters that you've done an amazing job summing up and analyzing all the proceedings. Thank you again! @chayam, Aren't synchronicities like that fun? What a crack-up. Looking at the pic on his Facebook profile, it looked like it was in the middle of nowhere. Don't get me wrong, I love a more natural setting. I want nothing more than to get back to our house in PA across the road from a cornfield. But I knew from the pic it wasn't a major destination, which is why it so strongly suggests to me that he chose it for the name. I don't doubt that there are many such little bergs in that area he could have chosen from. My greater concern is that he may be in the Kansas City area just to be in a town where he could be "the kingpin." And I'm so glad you've gotten some value from my little obsession. @The total surreality of my day -- I found chayam's comment totally by accident. It went into my email but didn't show up as a new message and move the top of the cue, as it's supposed to. But earlier, when I was trying to respond to Kathy's comment on the newest entry, there was no comment frame. I reloaded the page and half the comments disappeared but chayam's comment moved to that page, which is how I noticed it. Yesterday morning I woke up, looked at the clock, said, "Oh my god, it's 12:30 in the afternoon. Why do I still feel so tired," and promptly fell asleep again. I woke up an hour later, thought, "Geez, it's after 1:00. I gotta get up!" I came downstairs and looked at the clock. It was a not quite 8:30. Apparently, our clock which sets itself off the atomic clock in Denver had jumped time zones of its own accord and converted the temperature to Celsius. (That it was 28 degrees outside was the other mind-scramble.) So I reset it to what I thought was our time zone and fixed the temp, but I noticed later that it was somehow September 1st. So we took to calling the master bedroom the time machine. This morning, I awoke to my daughter announcing loudly, "What the heck? It's 65 o'clock?" It was also August 31st. So we lost a day and went into a non-existent timezone where there are at least 65 hours in a day. I said, "Nah... It's not 65:00. It's time to buy a new clock." I know things break, but that is the weirdest thing I've ever seen a clock do... ever. Has anyone caught the documentary about this on Netflix? I just watched it today.